Toppino's Reef, also known as the #1 Marker Reef, is perhaps not the most famous reef in the Florida Keys waters, but it does have some of the most unique marine life. 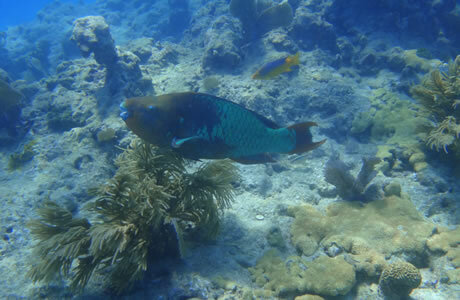 The dive is located at N 24 28 26 W 081 42 58 and offers great dive and snorkeling opportunities. The average depth of the water is 20 feet with the maximum depth only 25, which makes it an excellent choice if you're a novice. You will find the reef 4.5 miles south of the Boca Chica Channel. Toppino's Reef is probably best known for its beautiful and striking coral fingers. These fingers rise eight to ten feet from the ocean floor and are quite dramatic to behold. You'll find many beautiful, bright and colourful species of marine life feeding from the corals including green turtles, red mouthed grunts, and spotted butterfly fish. The reef was previously known as Marker Reef #1, but is now known as Marker Reef #31. To reduce confusion, many people simply refer to it as Toppino's Reef. If you are a beginning diver in the Florida Keys, you won't want to miss out on this great opportunity to see some world-class coral, exciting species of sea life, and beautiful clear waters. Many of the fish you can see at Toppino's Reef do not frequent other areas around the Keys as often, so this is a unique concentration of marine beauty.